What's a Southern belle to do in 1863? Wife-wanted ads are always risky business, but Millie Virginia never imagined she'd survive the perilous trip across the Great Plains to find her intended husband in a pine box. Was he killed in an accident? Or murdered for his gold mine? 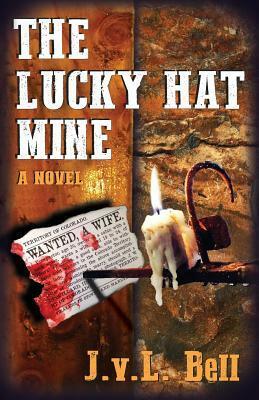 Stuck in the mining town of Idaho Springs, Colorado territory, without friends or means, Millie is beleaguered by undesirable suitors and threatened by an unknown assailant. Her troubles escalate when the brother of her dead fiancé, Dominic Drouillard, unexpectedly turns up. I really enjoyed this historical mystery-romance. It is a clever tale of greed, murder and suspense with a good dollop of romance and humour. I liked Millie and Dom. I found their banter and all their little arguments to be quite funny in places. I listened to the audio book and the humour in the pair verbally sparring came across very well. Millie was adorable every time she protested against being called Red. The side characters were also well written and provided much amusement. The darker, dangerous characters were menacing enough that the suspense and intrigue had me on the edge of my seat right to the end. I felt the danger that Millie and Dom were in but I was so engrossed in the story that I didn't stop to ponder on who their adversary was. I loved the romantic aspect of this story. For me, it was the perfect blend of romance and suspense. It was subtle and full of humour as the pair got to know each other. It took a second seat to he drama going on around them and the pace felt realistic. This was a great book and would certainly look out for more by the author. I listened to the audio book and it was narrated very well and was very easy to listen to. I would recommend the audio version for those who like audio books. Thanks to the author for the review copy.